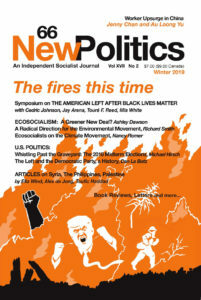 The Winter 2019 edition of New Politics marks the 100th anniversary of the Social Democratic-led German government’s assassination of the towering Polish-born German Marxist revolutionary Rosa Luxemburg, along with her comrade Karl Liebknecht. An appropriate way to commemorate her life and work is the symposium in this issue dedicated to engaging the award-winning essay by political scientist Cedric Johnson, “The Panthers Can’t Save Us Now.” Johnson’s class dissection of a black version of ethnic politics, his emphasis on democratic organization and debate for social-movement success, his views of the centrality of class struggle at the workplace and in the community and of the need for unifying class demands, all highlight central themes in Luxemburg’s work. Below I discuss how Johnson’s critique of the Black Lives Matter (BLM) movement elaborates on these Luxemburgist themes and provides a path to addressing not only police killings, but also the larger capitalist assault that drives them. Like Luxemburg in critiquing the nationalists—of both the oppressed and oppressor variety—Johnson interrogates the claims of Black Power advocates, such as Stokely Carmichael, coauthor of the 1967 classic, Black Power: The Politics of Liberation, and the contemporary “Black Power nostalgia” exponents, such as Alicia Garza, co-founder of #BlackLivesMatter. They all promote what he terms a problematic “black unity” politics. This politics is rooted in the theory of “black exceptionalism,” whose proponents “insist on the uniqueness of the black predicament and on the need for race-specific remedies.”3 Blacks of all classes face, according to Garza, who is a leading light among the new cohort of black unity exponents, a world where they “are systematically and intentionally targeted for demise.”4 The political practice that flows from this theory of black oppression is a unified black politics—with white and other “allies” possibly assisting—directed toward combatting a set of common oppressions and winning a set of demands that address the needs of a unitary black subject. Like Luxemburg, Johnson unearths the material conditions that guarantee, even more so than in the 1960s and 1970s, that a black-unity politics will be one that serves the black professional-managerial class and their corporate partners. The enormous expansion in class inequality over the last forty years among African Americans, which is even more pronounced than the gargantuan growth of inequality within the class structure as a whole, makes the search for black unity a chimera.7 One expression of this growing class divide has been the prominence among the BLMers of charter-school supporters and administrators tied to the finance capital that has pushed for privatizing public education and has sold privatization as “the civil rights movement of our day.” Yet, due to black-unity politics, leaders such as Patrice Collors support working with the increasingly influential black charter-school supporters and other black neoliberals. How Do We End Capitalist Violence? Luxemburg’s emphasis on the whole worker and the need to fight on various fronts, including housing, is central to the political project Johnson advocates. The policing crisis, he emphasizes, cannot be understood as a product of an unchanging, ahistorical “anti-blackness” or a “New Jim Crow.” Rather, it must be placed within the larger context of the four-decade capitalist war from above that has led to the marginalization of increasingly wide swaths of the population. The most marginalized have been the primary victims of the police killings, and while disproportionally black, many whites, along with Latinos, Asians, and Native Americans, have been targeted as well. In fact, Johnson emphasizes, contrary to the “New Jim Crow” analogy BLM and other activists use to characterize police killings, whites constitute the largest number of those killed by the police. This underscores for Johnson that only a broad, multiracial class movement can end police violence. This movement must bring in not only the most marginalized, who are so often the targets of police violence, but the broader working class who are also under attack on various fronts, from loss of pensions to outsourcing, home foreclosures, and other forms of capitalist-induced insecurity and dispossession. To build this movement, one that can draw in large swaths of the working class, Johnson advocates a program that goes well beyond the limited U.S. welfare state. He calls for the decommodification of housing, health care, education, and other basic needs and the creation of well-paying, socially productive, democratically run jobs and workplaces. This would require a mass direct-government program of employment in public works and public services, one on an even a larger scale than what Bayard Rustin and A. Phillip Randolph called for in their Freedom Budget of the mid-1960s. Rustin, like Johnson, “insisted that black progress could only be achieved through the development of broad, interracial coalitions dedicated to social democracy, a position that drew the ire of some Black Power radicals.”9 Presciently, Rustin predicted that the Black Power advocates he crossed swords with in the mid-1960s turning point of the civil rights movement would end up creating a “new black establishment” (emphasis in the original).10 But at the same time, Rustin’s strategy of operating within what he called the “consensus party”—the Democrats—including acquiescence to and support for the Vietnam War and the larger U.S. war machine, doomed any chance of winning his much-needed Freedom Budget or even concessions. Johnson’s support for Rustin’s interracial class politics, while criticizing his later turn to “insider politics,” implies that the movement Johnson proposes will need to have its own working-class, democratically controlled political vehicle if it is to make any advances. I am finishing this article in the days after the October 28, 2018, election of the fascist Jair Bolsonaro as president of Brazil. Far from an outlier, he is the most dangerous version of a whole layer of fascists, proto-fascists, and authoritarians who have arisen in the decade following the 2008 global capitalist crisis—which continues for broad swaths of the global working class. As Luxemburg powerfully wrote from a jail cell during the carnage of World War I, either humanity advances toward socialism or we face the further “regression of bourgeois society into barbarism.”11 These words have particular resonance today. Either we provide a real, working-class, socialist solution to the multiple capitalist-produced crises confronting wide swaths of the globe, or the fascists will impose theirs. To find a path out of the horrors of capitalism requires the global working-class movement to engage in serious criticism of our past mistakes. “Gigantic as his problems are his mistakes,” wrote Luxemburg as she sat in a German jail cell in 1915 for her opposition to the war that her former comrades in the German Social Democratic Party supported. The cruel and unsparing, but needed, criticism that Cedric Johnson provides, particularly of ostensibly progressive forces like Black Lives Matter, is exactly what we need if we are to avoid the mistakes of the past and confront the barbarians at the gates today. 2. Rosa Luxemburg, “The Russian Revolution,” 502-503. 3. 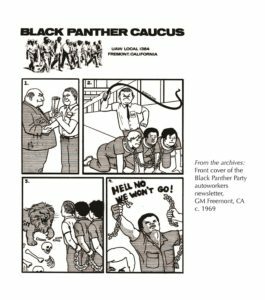 Cedric Johnson, “The Panthers Can’t Save Us Now,” Catalyst (Vol. 1, Issue 1, Spring 2017). 7. On growing intra-racial inequality among African Americans, see the study published by Credit Suisse and Brandeis University’s Institute on Assets and Social Policy (IASP), “Wealth Patterns Among the Top 5% of African-Americans,” Nov. 2014. 8. Rosa Luxemburg, “The Mass Strike, the Political Party, and the Trade Unions,” in Waters (ed. ), Rosa Luxemburg Speaks, 285. 10. Bayard Rustin, “‘Black Power’ and Coalition Politics,” Commentary (September, 1966), 36. 11. Rosa Luxemburg, “The Junius pamphlet: The crisis in the German Social Democratic Party,” in Waters (ed. ), Rosa Luxemburg Speaks, 357. 12. Rosa Luxemburg, “The Junius pamphlet,” 348.